This fine, expressively rendered carved basalt standing figural stele depicts a classic Aztec fertility goddess. This goddess is a truly classic Aztec sculpture, as defined by the extreme stylization of the human form and the balanced and sturdy minimalist geometric shapes. The Aztecs created a variety of freestanding deity sculptures, which were used in ritual celebrations intended to honor a pantheon of animistic deities representing different forces of nature and the human psyche. 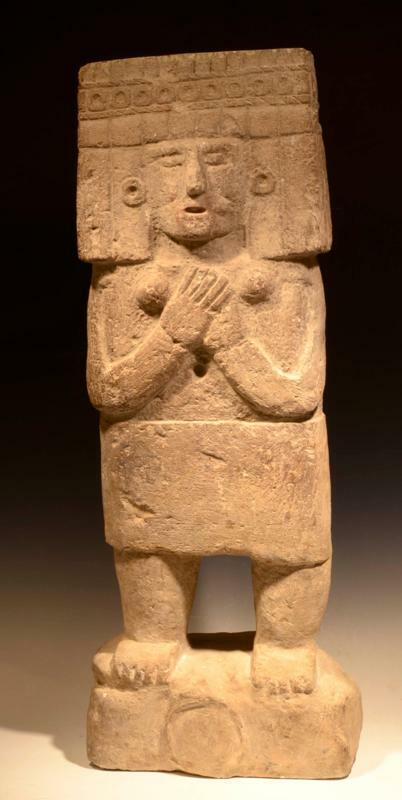 This goddess, with her rectangular headdress, geometric facial features, large round earrings, prominent breasts, and stable feet, very closely resembles an important Aztec deity, the goddess Chicomecoatl, ruler of maize and agriculture. Chicomecoatl was a classic agricultural fertility goddess, believed to rule the harvesting of crops. Traditional Chicomecoatl figures are depicted holding ears of corn, whereas this goddess bears no corn. We know from the literature (e.g. The Aztec Pantheon and the Art of Empire, by John MD Pohl and Claire L Lyons) that it is not uncommon for Aztec artist to create generalized deity figures that are based on the likeness of a particular deity and imbued with her characteristics, while not directly representing that deity. It is very probable that such was the intention of the patron or creator of this figure: to imbue her with the classic traits of a feminine agriculture goddess while not directly representing Chicomecoatl. Of particular interest on this figure is the omphalos, or the navel, at the center of the figures abdomen. The navel is circular, symmetrical, deeply carved, and highly pronounced and visible. This omphalos symbolically represents a navel, a hub, or a center of connectivity with the Earth and the natural forces that generate new life. Similar omphaloi are rare in Aztec art but can be found on some figures, most often on female goddess figures affiliated with agriculture, water, and fertility. There is one such figure currently in the collection of the Metropolitan Museum of Art that bears a striking resemblance to our goddess figure, complete with a similar composition, posture, headdress, and pronounced omphalos. (Met Museum Accession number 00.5.4). Our rare goddess at Art for Eternity is one of the larger and higher quality freestanding Aztec in circulation and is comparable with the aforementioned goddess at the Met. Height: 38 inches. Width: 12 inches. Pohl, John MD, and Lyons, Claire L. The Aztec Pantheon and the Art of Empire. Getty Publications, 2010. Solis, Felipe. The Aztec Empire. Guggenheim Museum Publications, 2004.